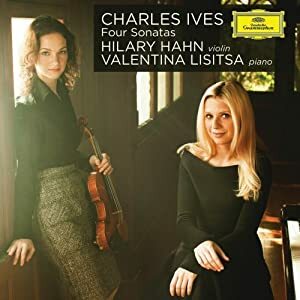 On Hilary Hahn's new album (13th overall, 7th for DG) the vitruoso offers up the 4 completed violin sonatas of Charles Ives, pieces that she'd been performing live in concert for several years with pianist Valentina Lisitsa, who appears on both her first studio recording with Hahn as well as her first on DG. As one goes through the 4 sonatas, it is evident throughout that Ives "painted" what he saw. The sonatas all contain themes from early-American songs, hymns and spirituals and seem to be inspired by contemporary life and activities in New England. Ives made a very interesting blend of his Americana with the sounds of a movement towards changing tonality in classical music. The four sonatas are all presented here in their final editions, the first 3 having been revised and re-thought by Ives in later years following the publication of the 4th and last piece "Children's Day at The Camp Meeting", itself the most well-known and shortest of the pieces. I always found the abrupt ending of the 4th Sonata perplexing, yet this piece was Ives' favorite and is the most performed. The highlights on the album are the 2nd movements of Sonatas #2 and 3: The 2nd Sonata's Presto (Titled "In The Barn") provides an incredible shot in the arm during an otherwise moody sonata. It was such a joy to see Hahn perform this piece live in concert a few years back. At times she seemed to move almost as if it were choreographed. On the 3rd Sonata's 2nd movement, marked "Allegro", the tempo is pumped fast and steadily by Lisitsa. A somewhat slower reading of this movement was recorded by Hahn herself on a 2008 episode of the NPR series From The Top, where she performed it with Christopher O'Riley, but even with the differences in tempo, Hahn's identity with the piece remains the same. Ives, having faced much criticism and scorn during his lifetime for his works, didn't begin to get recognition until peers and fellow composers like Aaron Copland, Arnold Schoenberg, and Leonard Bernstein spoke up for him. Hilary Hahn, having championed and re-popularized the rarely-performed Schoenberg Violin Concerto in her Grammy-winning 2008 recording may do the same for Ives’ work, and this could quite deservedly earn her another Grammy nod as well.